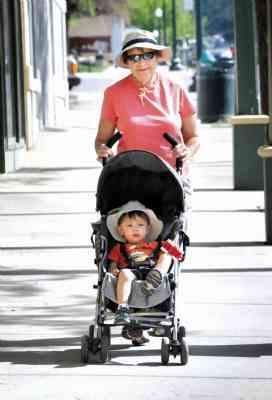 Ann Allsbrook pushes her grandson, Elias Javier, 2, at 13th Street and Main Avenue on the way to the Animas River Trail on Tuesday. “We always put sunscreen on him (and) a hat on him,” Allsbrook said. “Grandma does the same thing.” Allsbrook pointed to “sun spots” on her skin from sun damage. Older people tend to have more skin cancers because of a lifetime of sun exposure, doctors say. Overcast days, thunderstorms or even snow - in other words, the type of weather that's hindered our last two Memorial Day weekends - don't mean people who work or play outside needn't worry about the dangerous ultraviolet rays of the sun, two Southwest Colorado dermatologists say. "Every ultraviolet ray of sunlight that strikes you gets written in a tally book," said Dr. Susan Sanders, who's had a dermatology practice in Durango for 14 years. "It all gets remembered, although depending on genetics, some people do well while others don't." As we head into summer, medical professionals try to spread the word: Long exposure to the sun ultimately can cause skin maladies, including cancer. In an e-mail interview, Dr. Marcus Higi with Integrated Family Medicine and Aesthetics in Cortez said aging adds to the chances of getting skin cancer. "Older people have more skin cancers because of a lifetime of sun damage," Higi said. "New cancers tend to pop up due to damage already done." Higi also advised against the vanity tan. "They pay dearly later for sun - damaged skin, premature wrinkling and skin cancer," Higi said. "I've seen adults in the mid-30s with significant sun damage and even skin cancer. It's not worth it." Residents of the Four Corners, which ranks high for danger from ultraviolet radiation, aren't alone. The American Cancer Society estimates 60,000 cases of melanoma - the most virulent form of skin cancer - along with more than 1 million cases of less-severe basal cell and squamous cell carcinomas are diagnosed every year in the United States. Skin cancer is the most common of cancers, accounting for about 50 percent of cases, the cancer society says. The society estimated nearly 11,000 deaths from skin cancer in 2007, with slightly more than 8,000 attributable to melanoma. Skin cancers, even melanoma, can be cured if caught in time, the society says. The Web site of Cancer Council Australia says 430,000 Australians are treated for skin cancer annually - about 10,500 of them newly diagnosed cases of melanoma. About 1,600 people die annually from melanoma in Australia which, with neighboring New Zealand, is the area with the highest rate of skin cancer in the world. Skin cancer is largely preventable, the council says, offering an alliterative formula for avoiding dangerous ultraviolet rays: slip on clothing, slop on sunscreen, slap on a hat and slide on sunglasses. Also, stay in the shade as much as possible. Sanders and Higi said good clothing, including a head cover, is the first line of defense against the sun's glare. Sunscreen is second. Other recommendations: use wrap-around dark glasses and avoid the sun as much as possible between 10 a.m. and 4 p.m.
Higi said 10 to 15 minutes a day of direct sun provides the recommended amount of Vitamin D. Beyond that, don't go out without protective clothing and sunscreen, he said. Squamous cell (outer epidermis) and basal cell (deep layer of skin) carcinomas rarely spread, but melanoma does metastasize. Melanoma, by definition, is cancer of the melanocytes, which are pigment cells, Sanders said. Melanoma can get to areas that don't get a lot of ultraviolet rays such as the soles of the feet or the genitalia, she said. Sanders sees five cases each of squamous cell and basal cell carcinoma every day. She sees four to eight cases of melanoma a month. She doesn't find that unusual in Durango. "The people who move to Durango often have an outdoor lifestyle," Sanders said. "They usually haven't been good about taking care of themselves." "Slip on clothing, slop on sunscreen, slap on a hat and slide on sunglasses.